Every birder can recognize raptors, but there are subtle distinctions between different types of birds of prey which make each one unique. From size to wing shape to feeding habits, raptors are diverse and understanding the differences between the different types can help birders more quickly identify the birds of prey they see. Raptor is a generic term for all birds of prey. Raptors are carnivorous birds with strong bills, large talons, and exceptional flight capabilities. There are more than 500 species of raptors found throughout the world, and different types of raptors can be found in every type of habitat. From frozen tundras and scorching deserts to dense forests and bustling cities, raptors are key apex predators in every environment. Accipiters are relatively small, slender forest hawks with rounded wings and long tails that give them excellent flight maneuverability. Some of the most familiar accipiters in North America are the Cooper’s hawks and sharp-shinned hawks. Accipiters are some of the most common and numerous backyard hawks. They belong to the family Accipitridae, along with many other familiar raptors. Buteos are larger hawks with broad wings and relatively short tails that soar over the open country while hunting. Familiar buteos are red-tailed hawks and ferruginous hawks. Buteos are some of the most popular raptors and can be found in urban or suburban areas, and occasionally even in backyards. Most of these types of birds of prey, however, are found in less populated areas where prey is more abundant. Eagles are tremendously large soaring hawks in the family Accipitridae with exceptionally keen eyesight, very large, thick bills and powerful wings. Golden eagles and bald eagles are the most familiar species in North America, but there are many other eagle species worldwide. Eagles are often considered sacred to native tribes in countries around the world and are often worshipped in sacred ceremonies. Raptors in the scientific family Falconidae with tapered, pointed wings built for speed and agile flight are called falcons. The peregrine falcon is the world’s fastest animal with dive speeds up to 200 miles per hour. Other familiar falcons include the American kestrel, merlin and prairie falcon. Because of their speed and hunting prowess, falcons are some of the most favored birds for sport-hunting in falconry. Harriers are medium-sized hawks that fly low or hover while hunting over open country, often marshes or grasslands. Their unique facial disk helps them hear prey much better, and they hunt small mammals and rodents. These birds can also hover for brief periods as they hunt. The northern harrier is the only species regularly seen in North America, but other harriers can be found throughout the world. The word hawk is another relatively generic term for many different birds of prey. Raptors that are considered hawks generally have short, rounded wings and longish tails, but there are many variations among individual species. Hawks are generally divided into accipiters (forest hawks) and buteos (grassland hawks). There is a great deal of overlap, however, between the two types and their preferred habitats. Kites are small to medium-sized, agile birds of prey with tapered wings and graceful flight, and often with long, deeply forked tails. Most kites are regularly seen only in southern areas in North America, except the white-tailed kite, which can be found along the Pacific coast. There is a much greater variety of different kite species in Europe, the Middle East, and Africa. The osprey is a fish-hunting raptor and one of the most widespread birds of prey in the world found on every continent except Antarctica. There are only one species of osprey, and it is the only bird in the family Pandionidae. Its facial markings and long wings are good field marks, though this raptor is often confused with the bald eagle because of its size and it also has a white head. Owls are generally nocturnal birds of prey with upright posture and forward facing eyes set in a facial disk. Owls have keen vision, excellent hearing and nearly silent flight that make them superb night predators. The great horned owl and barn owl are widespread and familiar species, and the snowy owl is also well known, thanks to its popularity in the Harry Potter books and movies. Though not actually birds of prey, shrikes are passerines that have behavioral characteristics similar to many raptors. Shrikes have earned the nickname “butcher birds” because they impale prey on thorns or spikes in order to tear it with their relatively weak talons. 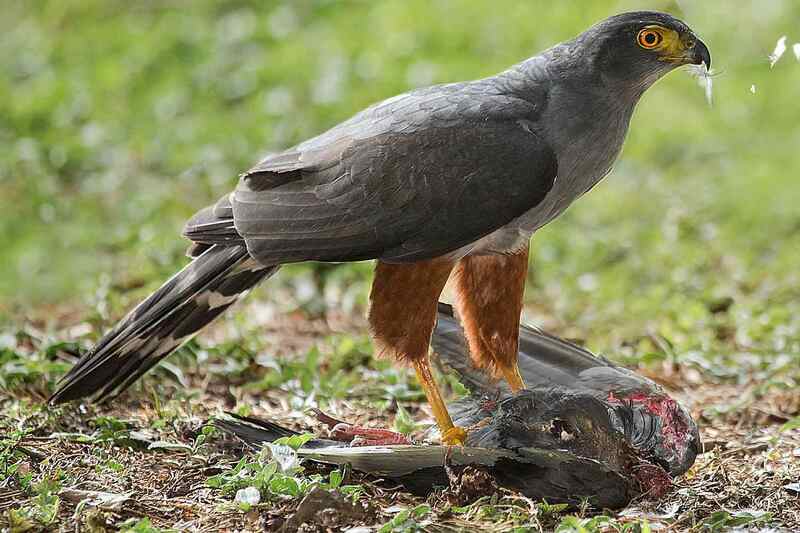 These birds generally prey on insects, small birds, lizards, and similar animals. The loggerhead shrike and northern shrike are the only species in North America, but there are many more in Europe and Africa. Vultures are exceptionally large, scavenging raptors with bald, featherless heads. Carrion is their preferred diet and vultures (often also called condors or buzzards) can soar for hours while searching for a meal. When a kill is found, many vultures may gather to take advantage of the same food source. Unfortunately, vultures face many threats, including lead poisoning from contaminated carcasses. Do You Know the Proper Names for Different Bird Flocks? Do You Love Birds Enough for Worship? Discover Bird Deities!